The chili was delicious and loaded with soft, luscious veggies. It had a rich, savory flavor and a meaty taste. There was a lovely seasoning, which created a moderate spiciness. 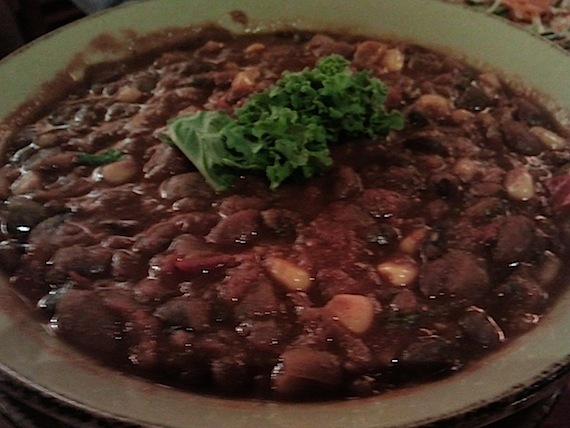 The soup was hearty and the taste of beans was strong, but not overpowering. There was also a light tomato flavor, which added a nice contrast and provided a subtle sweetness. Next, I tried some of my mom’s salad: The Seeker. This was wonderful. 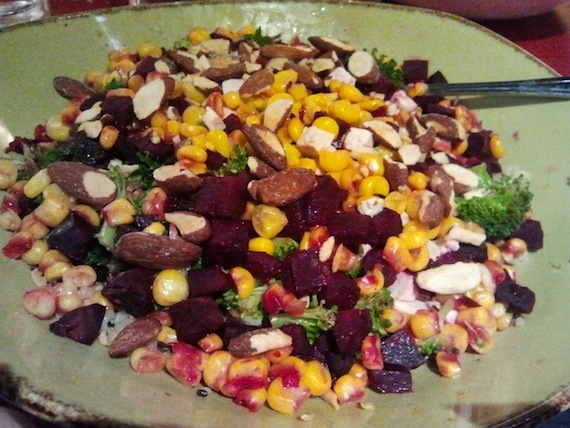 There was such a great mixture of fruits, veggies and nuts, which all complemented one another so well. The garlic-lemon hummus seemed more reminiscent of a savory pate, but was very smooth and creamy. It perfectly matched the lightly spiced ginger nama dressing, which had a very subtle sweetness. 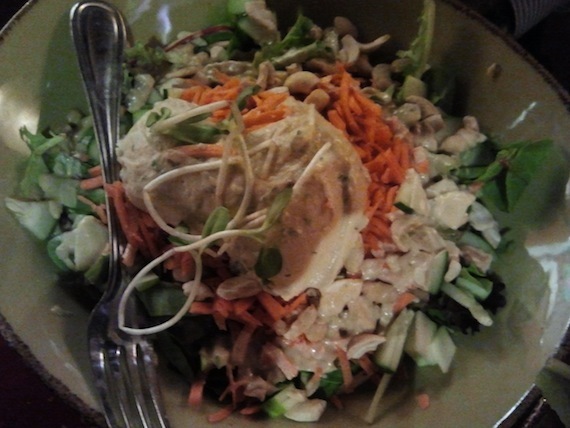 The salad was a great blend of sweet and savory flavors and soft and crunchy textures. Lastly, I had my own dish, a warm bowl called The Adventurer. This dish was amazing. The beets were a tad bit overpowering, but there were still so many other great flavors. The smoked tofu gave the dish a meaty flavor. The tamari roasted almonds were a great addition, giving the dish a subtly sweet flavor, along with the juicy bits of corn. I also substituted real cheese with daiya cheese, which melted on perfectly, giving it a cheesy flavor. The brown rice and quinoa were the stars of the dish, not only making it even healthier, but greatly enhancing the savory flavorings. I definitely recommend Life Alive if you are visiting the Boston area. While the food is healthy, it is so flavorful. The salads do not resemble the typical salad, but are much more inventive and tasty. Unfortunately, while Life Alive promotes a whole foods diet, they do carry real cheese, so buyer-beware. Nevertheless, every dish can easily be made vegan by substituting the real cheese with daiya or asking for it to be left out altogether. We were too stuffed for dessert, but Life Alive does have vegan ice cream, which looked delicious. 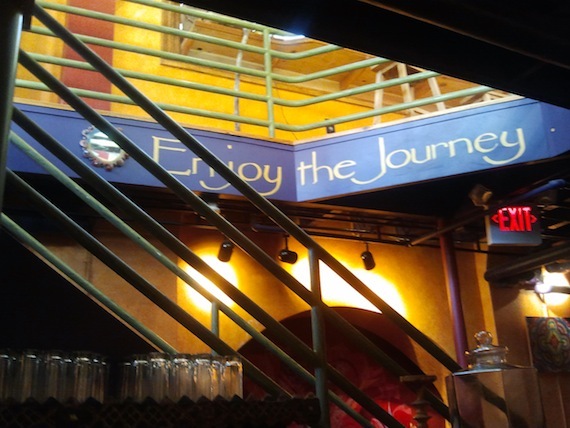 Check out Life Alive’s website for locations and menus. Yaaay!! I love seeing Life Alive get some well-deserved attention! I’ve never been to the Cambridge location, but have been to their Lowell one several times, as I live in southern NH. My husband and I absolutely love it. So much so that it was actually my choice for my birthday dinner back in May. I love their bowls of fresh veggies and yummy sauces and brown rice and/or quinoa. Their smoothies and lattes, with soy or rice milk, are also great. So glad to hear you enjoyed their awesome food, too! We used to live in Lowell, MA, where the original Live Alive is located. When we go home to visit friends and family this is the only place in Mass we never miss. The Boston area is surprisingly sparse on good vegetarian/vegan options, so Life Alive is a godsend. I’m so glad to hear the Cambridge locale is open and living up to the high Life Alive standards! Get out there. Taste the good eats. I recently moved to Boston and eat here almost every day! the Elvis Alive smoothie is out of this world, as is the green goddess bowl.